Will Caterpillar Raise Its Dividend in 2019? With huge gains for the heavy-equipment manufacturer, can dividend investors share in the good times? Check out the latest Caterpillar earnings call transcript. 2018 was a tough year for heavy-equipment manufacturer Caterpillar (NYSE:CAT). Despite strong economic conditions in its home market, Caterpillar struggled from a combination of weaker economies abroad and the negative impact of trade tensions between the U.S. and key trading partners, especially China. The result was a nearly 20% decline in the machinery giant's share price for the year. Yet dividend investors still have a lot to like about Caterpillar. With a solid dividend yield and a streak of dividend growth that hit the 25-year mark during 2018, many investors see Caterpillar as a great way to get healthy amounts of income that are likely to increase over the long run. But will economic pressures force the company to slow down its dividend growth in 2019? Below, we'll take a closer look at Caterpillar to see whether investors should prepare for tougher times. Caterpillar's yield got a nice bounce over the past year, rising from roughly 2.3% this time last year to about 2.7% today. That came about as a result of two things: the drop in Caterpillar's share price, and the annual boost it made to its dividend payment around midyear. For most shareholders, Caterpillar's woes throughout the year were depressing. After such a long economic expansion in the U.S., many investors focused on the potential for a reversal in Caterpillar's economic fortunes as a reason to get rid of the stock. Long-term investors in the equipment company understand that in a cyclical business, even what seems to be a rock-bottom valuation can be misleading, especially if earnings are artificially inflated during good times and then see significant drops when tougher times emerge. Yet the good news for income investors was that Caterpillar returned to a more typical level of dividend growth during the past year. After enduring its last cyclical downturn in the mid-2010s, the heavy-equipment maker responded by limiting its dividend hikes to the greatest extent possible while still technically maintaining its streak of annual dividend increases. That included just a $0.01-per-share boost in 2017. But in 2018, Caterpillar gave shareholders a hike of more than 10%, resulting in the current $0.86-per-share quarterly payout. The nice thing about Caterpillar's dividend increase was that it didn't come at the expense of financial prudence. Caterpillar's trailing earnings have risen dramatically even just in the past year, and that's given the stock a payout ratio of just 55%. That's a healthy level for Caterpillar, and it's well down from the more than 200% payout ratio the stock sported in early 2018. Should Caterpillar shareholders expect bigger dividends in 2019? For its part, Caterpillar is doing its best to stay upbeat about its future. Even with some global markets seeing pressure in their economic prospects, the need for spending in key areas like infrastructure should help keep the equipment manufacturer's earnings moving higher. For instance, in the energy sector, even though oil prices have been depressed lately, there are still significant imbalances in prices across different areas of the world that lend themselves to greater activity in pipeline and transportation-asset construction. Meanwhile, in sectors like housing, where it's likely that activity will pull back, Caterpillar's exposure is limited. 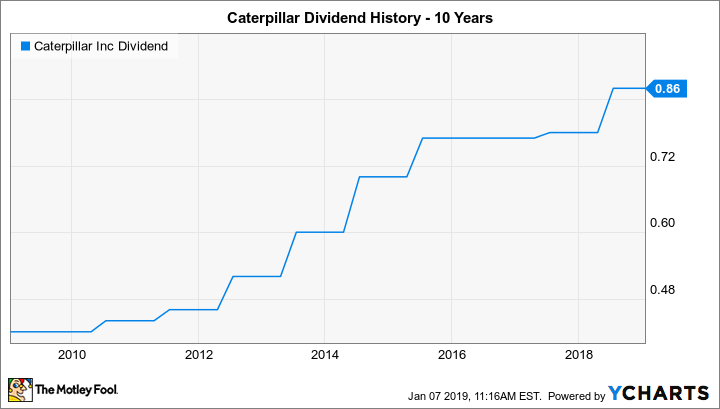 Perhaps most importantly, with Caterpillar having reached the 25-year mark in dividend increases, it's likely to become a member of the Dividend Aristocrats. The last thing that the company would want is to blow its chance to stay in the group that it just joined. Yet it's important to remember that it could technically skip a dividend hike during 2019 and still pay out more this year than it did in 2018 -- because of its midyear schedule for its increases. I think there's a good chance that economic concerns are overblown and that Caterpillar will again look to produce double-digit percentage growth in its payout this year. That would suggest a hike to $0.95 per share or more, and that'd be good news for income investors looking for solid long-term prospects.